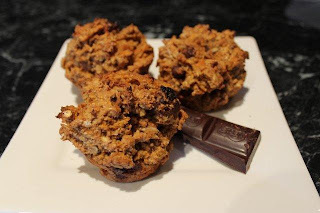 I created these to substitute my hubby's choc muffin fetish. He would stop off to grab a 600-700 Calorie muffin 3 days a week. As he is training I made these after some "sweetness" tweaking and he is happier and healthier. It is not the same as a double choc giant muffin but they are pretty tasty and an easy swap. Sorry the dark chocolate pictured on the plate is not included. Eat that and you can add another 50 calories per square. 2. Sift flour and baking powder together into a large bowl. 3. Stir in all the dry ingredients. Add grated carrot and mix well. Make well in centre of mixture. 4. Melt butter in microwave for 25 seconds in a cereal bowl. 5. Add milk, molasses and prepared No Egg to melted spread and pour into dry mix. 6. Lightly fold mix adding enough of the water to make a thick but wet muffin mix. DO NOT OVER MIX. Mix only until just combines and spoon into muffin trays dividing into 26 portions. TIP: No Egg is replacing 3 egg whites. If you want to use egg whites just adjust the calories – approx. 15 calories per egg. Use whatever dried fruit you like instead of the fruit medley. Keep refrigerated or freeze what you don't need as they don't have preservatives in them and are best fresh.